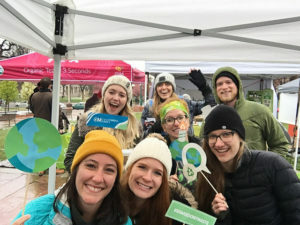 It was cold and snowy, but that didn’t stop Circuit Media and other local organizations from participating in Earth Day events this past Saturday! Circuit Media Green hosted a table at the Colorado Sierra Club’s Earth Day event to promote our Shake It, Don’t Waste It campaign. Locus Studios created a fun Snapchat filter that was available at the event. We also set up a photo booth for people to stop and take pictures. CM Green had a lot of fun spreading our message and meeting event goers and local organizations. We enjoyed learning about other efforts to create a waste-free environment. Circuit Media is a certified green business through the City and County of Denver. Circuit Media Green is our environmental messaging program and hosts information about our involvement with green organizations. Shake It, Don’t Waste It is Circuit Media’s first campaign to promote waste-reduction. If you weren’t able to make it to the event but still want to learn more, contact us. Our team members are happy to talk to you more about our Shake It, Don’t Waste It campaign! If you’re a business interested in putting up posters and stickers around your office, let us know. We have a limited supply available by request.